Located prominently in the north-central Pacific Ocean, the Hawaiian Archipelago extends for some 1,600 miles from Kure Atoll in the northwest to the island of Hawai‘i in the southeast. The formation of these islands began nearly 70 million years ago when lava extruded from a stationary “hot spot” in the ocean floor and created the islands one by one as the Pacific Tectonic Plate moved gradually to the northwest. Although all islands in the Hawaiian Chain are of volcanic origin, those in the northwest have eroded sufficiently during their geologic history that they persist today mostly as coral atolls and low-lying rock or sand islands without flowing fresh water. In sharp contrast, the southeastern high islands usually have fresh water in abundance, and, for this reason, they are clearly the geographic focus of this book on the native freshwater animals of Hawai‘i. If one considers that the Hawaiian high islands are surrounded by salt water for over two thousand miles in any compass direction, at first it seems remarkable that they have any fresh water at all. However, on each island, tradewinds from the northeast push moisture-laden air up the sides of mountains to elevations of two to three thousand feet where cooler temperatures cause the moisture to condense into the orographic rain that keeps many streams flowing all year long. (At left, waterfalls high in Wailua Valley.) Annual rainfall in Hawai‘i averages 25 to 30 inches, but precipitation on the windward sides of islands can be 10 to 15 times this amount while, on the leeward or dry sides of islands, the amount of rain received during a year sometimes can be expressed as a single digit. Thus, perennial streams, i.e., ones that flow continuously, are a typical geologic feature of the windward sides of islands, and intermittent streams are most common in the rain shadow of the leeward sections. Although tradewinds are persistent, they are not necessarily constant. Occurring mostly during winter, Kona storms moving toward the Hawaiian Islands from the northwest may impede the flow of the trades and produce heavy rainfall on the leeward sides of islands. These storms are often followed by a temporary “greening” of the usually dry areas, and it is during this time also that intermittent streams flow temporarily into the ocean. Although incompletely understood, the differential warming of surface waters attributable to El Niño also has been implicated in the disruption of the usual flow of tradewinds and patterns of rainfall among the islands of the Hawaiian Chain. Graph of Honoli’i Stream (Hawai’i) flow. 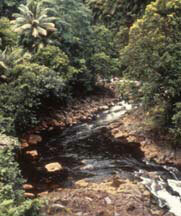 High quality Hawaiian streams are typically clear, cold, and have a strong flow all year long. In such streams, there is little accumulation of sediment, leaf litter, and other loose debris because of uninterrupted flow and, just as importantly, because of powerful freshets or flash floods caused by localized heavy rains in the mountains or by the passage of weather fronts that can occur any time of the year but are most frequent during winter months (February through April). Because of frequent flash floods, mountain streams are best described as dynamic rather than stable; in fact, each stream characteristically remains in a constant state of recovering from the most recent freshet. Biologists have learned that animals in these streams survive, not in spite of episodic floods, but actually because of them. Flash floods flush away rotting organic debris that contribute to oxygen depletion during periods of low water, they remove fine sediments that can smother the eggs of stream animals, and they open up the stream where it flows into the sea to facilitate the recruitment of stream species with a marine larval phase. There is increasing evidence that flood waters entering the sea provide a biological signal important in the timing of onshore migration of larval fishes and crustaceans that live as adults in freshwater streams. Continuous flow and naturally occurring flash floods restrict underwater (non-emergent) vegetation to those species of algae (navicular diatoms and low-growing green and blue-green algae) representing early successional stages. These plant species are essential food items for one species of fish that is an obligate herbivore and are important also in the diets of at least two other species of fishes and probably all stream macroinvertebrates (mollusks and crustaceans). Text: excerpts from a manuscript by J. Michael Fitzsimmons, Lousiana State University. With permission. Photos: Department of Land and Natural Resources and Darrell Kuamo‘o, Division of Aquatic Resources.